Teachers Using Technology: Twitter in Education: Not just for celebrities to make fools of themselves anymore. Twitter in Education: Not just for celebrities to make fools of themselves anymore. Twitter. The word used to cause me to cringe. We've all seen the escapades of celebrities; the cat fights, the drunken tweets, the pictures that you can't un-seen. It seemed like the only thing Twitter was good for was making a fool of yourself or providing fodder for future blackmailers. I finally created a personal Twitter account a few years ago to follow event activities and to try my hand tweeting about Phoenix ComiCom (#PHXCC). It was an interesting experience. Have you ever tried to express yourself in 140 characters or less? I found that I preferred to be a Twitter Lurker, following others on Twitter and occasionally commenting when something caught my eye. I followed a few celebrities and political figures that I liked, as well as some friends, but that was it. I did get into a fun Twitter argument with Adam Baldwin (Jayne from Firefly, John Casey from Chuck). He actually conceded the win to me. That was a proud day in my Twitter history. I never though Twitter could really be something useful, especially in education. But that has since changed. There are several areas that make Twitter an attractive and useful EdTech tool. It is great for your own PLN (Professional Learning Network). It can be used in the classroom to discuss current events. (It is a historical record.) And Twitter can be used to assess a student's understanding of material. Who knew Twitter could be useful? EdTech advocates are jumping on board the Twitter train for their own edification. The new buzzword in PD is PLN. It means developing your own network of education professionals to collaborate with, learn from, and share resources. Blogs, like mine, are popping up all over. Other teachers who are passionate about EdTech are sharing their knowledge and experience. That is one type of PLN resource, and I love them. But blogs are static. There is rarely any discussion on the blog, just one person's experiences. In today's fast past society, we want lots of information and resources, in one place, in small bites, and with input from others. That is were Twitter comes in. Educators now have the opportunity to participate in weekly Twitter "chats" about education. 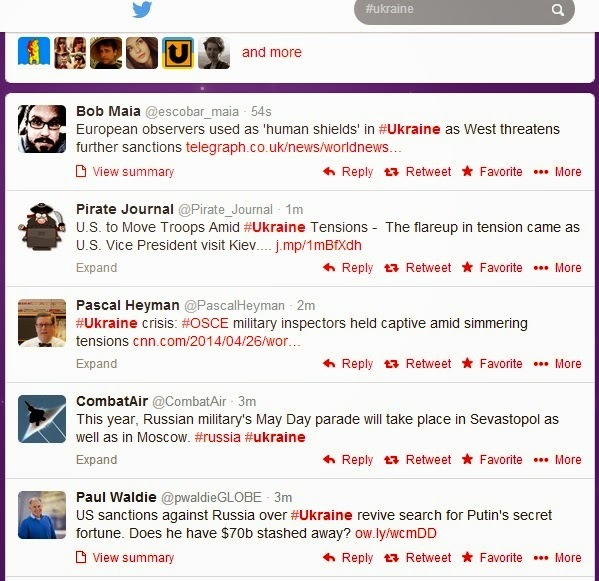 These are moderated events with a set time, topic, and hashtag. ALWAYS use the # for your current Tweet chat. I was in the #EdTechBridge chat. I forgot my # a couple of times, and my comments were lost to the rest of the participants. When a question is asked by the moderator, they will start it with Q1, Q2, etc. When you respond, don't respond Q1. Respond with A1, A2, etc. Even when you go off on a side discussion with a colleague, still use the #, because others actually are interested in what you are saying. Twitter chats are one way that Twitter can be a powerful educational tool. I much prefer learning from other educators who are currently in the field, not from white papers written by people who have not been in the classroom in years. Twitter chats allow me to learn from my peers. Here is a Google Doc that list all of the weekly Twitter Ed Chats, their times, and the associated hashtag. Check out one that interests you. Even if you don't contribute, follow the # and see what others are saying. This can lead to a whole new discussion. What makes something trend? 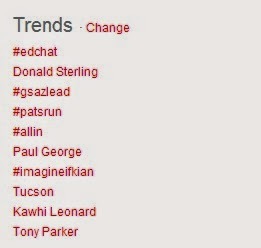 Why are people talking about Tucson, Donald Sterling, or #gsalead ? Why are these topics important? What do they have to do with you? How do they impact the world or do they? You could teach an entire class that develops critical thinking skills using Twitter Trends as your source material. I am not an English teacher, nor could I ever be. English teachers have a huge challenge in today's world trying to make students raised on technology understand why literature that is old is relevant. Hats off to all the ELA teachers out there. But from talking to my colleagues, I know that assessing their understanding of a topic can be challenging. Essays are too easy to buy or access for free on the internet. Plagiarism is rampant. And unless you or your school invests in the software to check for cheating, it is sometimes nearly impossible to discern if a student actually "gets it" or if they are great at using Google and cutting and pasting. But ask a student to compose a tweet that Romeo would send about the fight with Tybalt? What would Juliet Tweet when she found out Romeo was from a bad family? Now you have their attention. The format may be different, but the checking for understanding still exists. A student that can show the main conflict in a novel in 140 characters or less understands the material. Students can use a class Twitter account (or their own, if you are brave) to send Tweets using a # that you assign. #Romeosproblems #Julietswhining #RandJweregansters . You get the idea. Now understanding Romeo and Juliet is a challenge. The students want to write witty and insightful tweets that will get noticed. That requires understanding the material. You can also have your students use Twitter to see what others are saying about the books they are reading, to prompt discussions with others on Twitter about the book, or if you are James Joyce fan, use Twitter to retell Ulysses in a series of Tweets. The possibilities for application in the classroom are endless, limited only by your creativity. Twitter is no longer just a place for fans to find out what their favorite celebrity had for lunch. Twitter can be used for our own personal growth as teachers, to provoke conversation and critical thinking in our students, and to check for understanding of material. It can be a very powerful tool, if we use it properly. It can also make you the cool teacher on campus, not that we care if our students think we are cool or not. Really.